How will you know the flag-bearer of American tennis when you see him? He’ll be wearing Stars & Stripes shoes. In front of the glimmering lights of Atlantic Station and the biggest crowd of the tournament so far, Andy Roddick stepped onto Stadium Court with flashy kicks but delivered a workman’s effort in a 6-3, 6-4 win over Michael Russell in the quarterfinals of the BB&T Atlanta Open on Friday night. Roddick converted the match’s only two breaks to seal victory, going two of 4fouron break chances compared to zero for one performance from his American opponent. And, at this point, everyone on the tour knows what happens if Roddick can add a couple of breaks to his legendary service game. On this night, his serving was nothing less than that as he posted a 72 percent first-serve percentage and 12 aces to boot. “If I could take the serving stats from today and apply them to any match, I’d sign that contract right now,” Roddick said with a smile after his straight sets win. Up 4-3 in the opening set, Roddick sealed his first of two breaks in the match when Russell lofted a forehand on break point to give the big server a two-game lead. The tournament’s fourth seed then served out the set despite Russell fighting to deuce; crushing a forehand winner down the line and an ace out wide for the set. It was a scene that would soon repeat itself. “If I’m using a metaphor, I’d say I felt like I could throw any pitch for a strike tonight,” Roddick said. It would be a pitcher’s duel again to open the second set, until Roddick got up 30-0 on Russell’s serve with the set knotted at 3-all. But the 96th-ranked Russell reeled off four straight points to push ahead and show his tour-tried toughness. 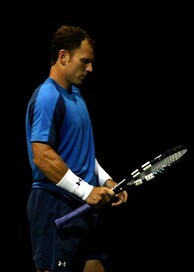 Roddick, though, wasn’t done doing work. He turned around and won his next service at love, and picked up where he left off on Russell’s last service game. This time, however, Roddick earned triple break point by pressuring three straight Russell second serves, finally notching the valuable break when Russell netted a forehand at 40-15. Up 5-4 and serving for the match, Roddick surprisingly yielded a break point to Russell before blasting three straight serves that the lower-ranked American couldn’t get near the court to clinch the win. It was another major building block toward the goal of Olympic gold and possibly one more U.S. Open crown that the stalwart of American men’s tennis is marching toward this year. But, for right now, it’s the BB&T Atlanta Open on his mind.